The global theatrical and home entertainment market generated $96.8bn in 2018, a 9% increase on 2017, according to a new report from the Motion Picture Association of America (MPAA) that for the first time combines data from both sectors. The 2018 THEME Report published on Thursday (March 21) noted that global box office climbed 1% on 2017 to reach $41.1bn, while home entertainment grew 16% year-on-year to reach $55.7bn. Among the report’s key findings are: a 20% year-on-year drop on global 3D theatrical box office to $6.7bn reflected in a decline across all regions; higher revenue from cable subscriptions than online video subscriptions even though the latter overtook the number of cable subscriptions for the first time in 2018; and the fact that Americans now spend 52% of their media time on a digital platform. Box office climbed 1% on 2017 to reach $41.1bn. Seven international markets saw box office totals of $1bn or more. Asia Pacific climbed 5% to $16.7bn driven by China, which experienced a 12% gain. Europe, Middle East and Africa dropped 3% to $9.8bn, driven by 14% declines in each of Russia and Germany, while the UK climbed 2%. Latin America declined 22% to $2.7bn, with a similar percentage drop in Brazil, and currency depreciation leading to a 41% decline in Argentina and a 2% drop in Mexico. China was the top individual territory outside North America on $9bn (includes ticketing fees – total excluding ticketing fees is no longer made available), followed by Japan on $2bn, the UK on $1.7bn, South Korea and France both on $1.6bn, India on $1.5bn, Germany on $1bn, and Australia, Mexico and Russia on $900m apiece. Indonesia ranks 15th on $400m. All data in USD terms. Global 3D box office reached $6.7bn, down 20% on 2017 following a drop in all regions. The worldwide cinema screen count climbed 7% to nearly 190,000, driven by 13% growth in Asia Pacific. By the end of 2018, 97% of the world’s screens were digital. 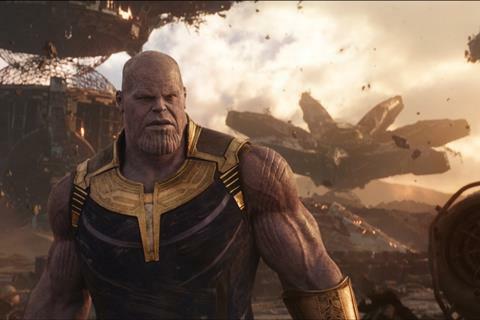 Avengers: Infinity War was the top global release of 2018 on $2.048bn. North American box office grew by 7% to reach a record $11.9bn, up 4% from the previous best in 2016. Admissions climbed 5% to 1.3bn. Frequency of theatre-going: Three-quarters of the population, or 263million people, visited the cinema at least once. Average attendance by age was highest among the 12-17 and 18-24 demographics at 5.1; by ethnicity highest among Latinos (4.7) and Asians (4.5). All age groups except 25-39 and 60+ increased attendance in 2018. Frequent cinema-goers (at least once a month) accounted for 12% of the population, or 43m, but 49% of tickets sold. The average ticket price for 2018 was $9.11, up 2% on 2017. The number of films released in 2018 was 758, down by 3% on 2017 and up 36% compared to ten years ago. Non-MPAA-affiliated distributors released the lion’s share of films (631) and dropped 4% year-on-year. MPAA member studios release 127 films, down 2%, driven by a 20% decrease in films released by studio subsidiaries. The top 139 films accounted for 95% of 2018 box office. The estimated number of US films above a $1m budget that entered production was 576, up 5% on 2017. Of those, 171 had a budge of more than $15m. There were 107 films by MPAA member studies that entered production in 2018, on par with 2017, while the number of non-MPAA studio films climbed 6% to 469. PG13 films comprised 17 of the top 25 releases in 2018, up from 15 in 2017. The top 25 films accounted for 54% of total box office, and the top five accounted for 23%. Black Panther was the top film of the year in North America on $700.1m. 2018 home entertainment consumer spend climbed 16% to reach $55.7bn. US digital spend increased by 24% and international by 34%. Since 2014, digital spend increased 170% globally. Global physical spend decreased by 48%. The number of subscriptions to online video services (613.3m) such as Netflix and Amazon Prime grew by 27% or 131.2m compared to 2017. Online video subscription services overtook cable subscriptions for the first time in 2018. Households with pay-TV and online subscriptions are counted in both categories. Cable was still the higher revenue generator on $118bn following a $6.2bn rise. In 2018, overall spend on home entertainment (digital and disc) climbed 12% to $23.3bn. Spending on digital home entertainment grew 24%, and physical declined by 15%. Transactional spend dropped 5%, while subscription spend increased 28%. Online video content viewing grew 24% to 182.1bn views / transactions. Online film views / transactions grew 29%, and TV views / transactions grew 23%. There were more than 140 online services providing film and TV to US customers. The number of subscriptions to online video services climbed 17% to 186.9m as subscriptions to other kinds of pay-TV services dropped. As with the global picture, cable remained the higher revenue generator on $55.4bn after a 3% rise. After cable and satellite (satellite generated approximately $45bn in 2018 after a slight drop against 2017), online subscription video climbed 39% to $20.6bn. Americans continued to spend more time watching television (three hours and 45 minutes a day on average) than any other form of media despite an 11-minute decrease. Americans spent 52% of their media time on a digital platform, compared to 11% listening to radio, and 3% reading print. Overall spend on home entertainment in the US increased 12% to $23.3bn. More than 80% of US adults watched film and TV shows via traditional services. TV services also have the highest proportion of daily viewers – 33% of adults watch TV shows daily, and 21% watch films daily on traditional TV services. Online subscription services, which more than 70% of adults use, have similar but slightly lower viewing levels. Physical discs were used more often for films (68% of adults) than for TV shows (50%). Online EST (electronic sell-through) and VOD services were used by 35% of Americans to watch TV shows, and 44% of Americans to watch films. Every-day viewers of traditional TV and online subscription skewed slightly towards women, while men represented a higher proportion of consumers in the every-day category when it comes to EST / VOD and physical discs. The Hispanic / Latino demographic over-indexed in the population of every-day home viewers in EST / VOD (24%), physical discs (23%), and online subscriptions (22%) compared to their 16% share of the population.